Hanging plants is a way to keep them out of the reach of curious animals. 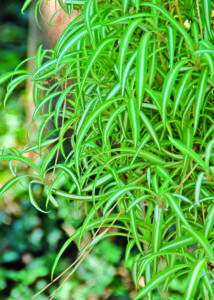 Houseplants make a wonderful addition to our home’s décor and improve indoor air quality. Those with pets, however, may struggle with keeping plants safe from curious pets and the pets safe from indoor greenery. The good news is you can grow an indoor garden even when you own pets. Yes, some do love to dig in the soil or even eat our favorite houseplants, but with proper plant selection and planning, you can keep your pets safe while enjoying an indoor garden. Incorporate a few easy-care plants like blunt leaf peperomia, cast iron plant, spider plant and Swedish ivy that are not toxic to cats and dogs. Add some color to your indoor garden with dog-and-cat-safe African violets and Phalaenopsis orchid. Next, adjust your gardening style to keep your plants safe from curious pets. Mulch the soil in large planters with chunky woodchips or decorative stones to prevent cats from using the planters as a spare litter box. Just make sure the mulch is not attractive and doesn’t pose a danger to dogs or other pets that might be tempted to eat the mulch or get it lodged in their mouths. Or invest in a commercial mat designed to prevent digging. Most are made of plastic or rubber with upward facing nubs that humanely discourage digging. Just cut the mat to size and set it on the soil surface. Break out the homemade or commercial repellents for those persistent pets. Use products labeled for this purpose, or make sure your homemade concoction is safe for pets, plants and furnishings. Melinda Myers is the author of more than 20 gardening books and is the host of The Great Courses’ How to Grow Anything DVD series. Her website, MelindaMyers.com, offers gardening tips and videos.